We like boats -- we like working on them, playing on them and the lifestyle that comes with having a boat. 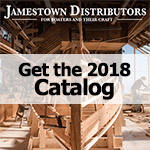 Jamestown Distributors has been helping people with their boats and boatbuilding needs since 1977.
more than a toy or a material object. supporting Boaters and their Craft.